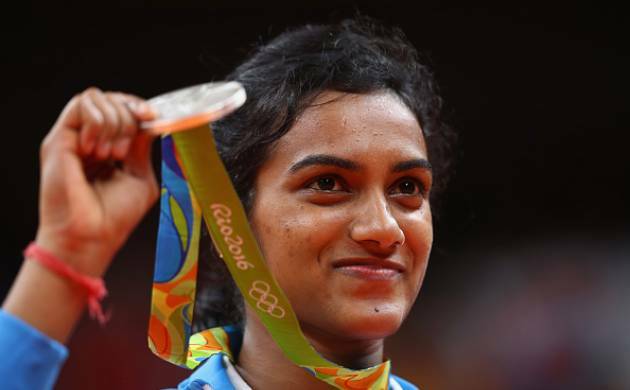 P V Sindhu says that she is happy to win a silver in the women’s singles badminton event after her gallant attempt to win a coveted gold for India which ended in heart-break at the Rio Olympics. P V Sindhu today said she is happy to win a silver in the women’s singles badminton event after her gallant attempt to win a coveted gold for India ended in heart-break at the Rio Olympics here today. “I ended up with silver medal but am really happy,” said Sindhu moments after losing her final clash 21-19 12-21 15-21 against two-time World Championship Marin here. “I’m really proud about it. I’m really happy. I could not win the gold. But I really worked hard. It was anybody’s game. “I really fought very hard and gave my heart out. When I came to final, I told myself just one match to go and you could win a gold medal. Give it your best, and I tried very hard. I feel it was her day, I am on Cloud nine, now I am an Olympic Silver medallist and dedicate this medal to Guru Gopi, says Sindhu she added. Sindhu also lauded Sakshi Malik, who opened the India’s medals tally with a bronze at the Rio Games and became the first Indian woman wrestler to win a medal in Olympics. “A day before a girl has got a bronze, it’s me now. We have all played well. There will be ups and downs in sport like in life. Losing one or two points. I would like to congratulate everyone. It’s been a great week for me.“I never thought I would make it to the final, but when I finally made it I thought I’ve to, I really worked hard. I missed the gold. ”Praising Marin on her Olympic gold, Sindhu said: “I also congratulate Carolina. It’s been a wonderful week for me. It’s anybody’s aim to win a medal at the Olympics. ”Talking about the final match, Sindhu said: “In today’s match both players were attacking and playing aggressive on court. One has to win and one has to lose. It was her day on centre court today. I’m very happy for her. She’s doing a great job.“Overall, it’s not that I didn’t play well or get points. It was a good match, I can tell you. After the second game, we both were 10-all in the third. She took a lead of four points, and that lead went on. There were simple errors from my side,” she explained. The 21-year-old from Hyderabad said bright days are ahead for Indian badminton. “Future is good definitely. There are many players coming up, and many more will succeed. Badminton is doing really well in India. In men’s singles Srikanth lost very closely,” she said.